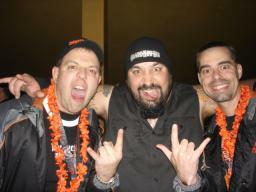 Fritz and Rick attend the Jagermeister Fall Music Tour in New York City on November 9, 2007!!! Fritz's Polka Band is truly proud to be a member of the Jagermeister Family. Just one of the many perks that Jager provides bands is the opportunity to check out the Jagermeister Music Tour (in a VIP way!) when it's in-action. 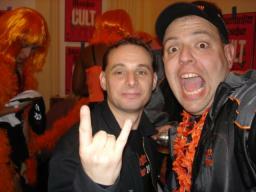 On Friday, November 9, 2007, Fritz and Rick made the trip to New York City to check out the Jagermeister Fall Music Tour, at the Hammerstein Ballroom featuring The Cult as the headliner. Action Action was also on the bill, along with Brand New Sin (from Syracuse, NY!). Fritz and Rick had a blast meeting old friends from the "Jager Family" that evening, as well as making new friends. Below are 13 pictures taken that festive night. During the start of the Jagermeister VIP Party at the Hammerstein Ballroom in New York City, Rick and Fritz are pictured here with Rick Zeiler, Director of Marketing and Brand Management for the Sidney Frank Importing Company (the company responsible for importing Jagermeister). 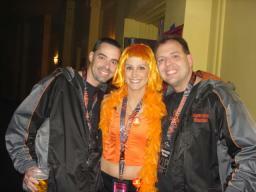 Rick and Fritz happily pose with a Jagerette during the Jagermeister VIP Party in NYC on November 9th. 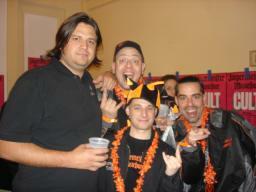 Fritz is havin' fun (as the song goes) during the Jagermeister VIP Party on November 9th at the Hammerstein Ballroom. 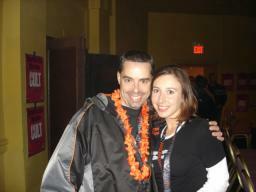 Rick is shown here with a new Jager friend, Kristina on November 9th at the Hammerstein Ballroom. Fritz and Rick pose here with Joe Altier of Brand New Sin (BNS) after the awesome opening set from BNS on November 9th at the Jagermeister Music Tour stop at the Hammerstein Ballroom in NYC. Fritz is pictured here with Jagermeister band rep, Adam Grayer, during the Jagermeister VIP Party on November 9th at the Hammerstein Ballroom. 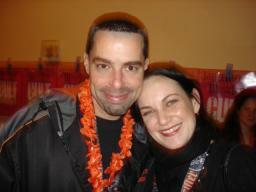 Rick and his Jager friend, Tracy, are shown here on November 9th at the Hammerstein Ballroom in NYC. 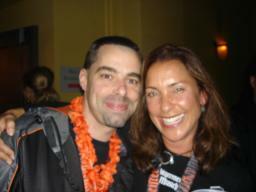 Rick and his Jager friend, Diane, are pictured here during the Jagermeister Music Tour stop at the Hammerstein Ballroom. Rick and Fritz partying it up with some Jager friends during the Jagermeister VIP Party at the Hammerstein Ballroom on November 9th. 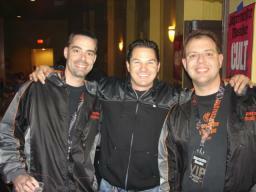 Fritz and Rick party with Jack Carson (L) the Jagermeister Tour Manager and Adam Grayer (C) the Jagermeister Band rep during the Jagermeister VIP Party on November 9th. Fritz partying with the Jagerettes on November 9th during the Jagermeister VIP Party in NYC. Prior to The Cult taking the stage, Fritz and Rick got the opportunity to meet them backstage at the Hammerstein Ballroom in NYC. 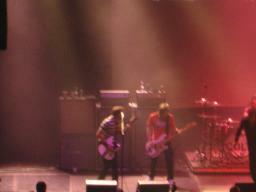 The Cult rips through a tune during their headlining set on November 9, 2007 at the Hammerstein Ballroom in New York City during the Jagermeister Music Tour.